I installed the RFXCOM and pushed the button in the remote control of my Rollertrol blind motor and the device was added to the vera.When I press buttons on the remote the device status is updated but when I press the open, close, up, down buttons on the Vera dashboard nothing happens, no command is sent and the status doesn't change. I would appreciate any help with this. Hi @XJezreel, sorry to hear you are having this difficulty. It used to be such an easy process - I have a UI5 unit running fine here, with the older USB transceiver. So today I pulled a new Vera unit with UI7 from our stock + a new version of the USB transceiver. I'll set them up on my test bench to see what's up with that. If necessary, I will write a new plugin for it, after I finish the current wifi relay project. I doubt that I will have to do that as @lolodomo is an expert with the RFXCOM plugin, so it's probably some minor glitch. Hi @XJezreel, I've asked Bert at RFXCOM tech support to weigh in on this, and here's what he said (below). One thing I did not realize is that the new version of the RFXCOM default firmware it ships with only has the RollerTrol TRANSMIT protocol enabled (not RECEIVE). This would certainly explain why the RF signal from the remote control of our blind motors is not showing up in the Vera interface. In Type2 firmware you can enable the Blinds T0 protocol for receive. All other protocols are disabled at that time, so it should be used temporarily to receive the remote control transmission codes so that you can use the same code in the application as the remote to control that motor. If you don't need to use the RFXCOM transceiver for any other purpose, you can leave it with this firmware installed. 1. The RFXtrx433E is default delivered with Ext firmware which supports Rollertrol TRANSMIT, not RECEIVE. 2. Type2 is the only firmware that supports Rollertrol RECEIVE so that the channel ID of the remote control transmission can be received. 3. If the RFXtrx433(E) does not contain firmware Type2, then you can re-flash Type2 firmware in the RFXtrx433E. 4. If you have a Windows system you can test the RFXtrx433E functions with our Rollertrol radio motors very easily using the stand-alone RFX Manager program. You do not need Vera to control our shade motors if you prefer to do it with a PC, but using Vera will provide a lot of extra functionality. The RFX Manager program is also a good way to test that the transceiver and motors are working, if you have a problem with Vera. A. Click Get Status in RFXmngr and you can check the firmware version. 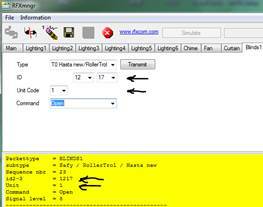 D. Transmit a command with the Rollertrol remote. F. You should be able to control this Rollertrol motor now using RFXmngr with up/down/stop commands. G. If you transmit a command the red LED should blink on the RFXtrx. Hi Adrian, Thank you so much for your help! I just got around to working on this today and after updating the firmware I can now control the blinds with the Vera! your instructions were perfect! I am a newbie about blinds and shades automation. I've been going through the forums and RollerTrol and RFXCOM websites and still confused. My understanding is that if I buy Z-wave motor controller DCC-ZWAVE-12R for $59 from RollerTrol, I don't need to get RFXtrx433E which cost $199.95 anymore. Am I right? "When using the DCC-ZWAVE-12R Z-WAVE? controller with our blind and shade radio motors, it is used to trigger our DCG-1R-RFT"
The RFXtrx433E (111 euro world-wide shipping) can control the Rollertrol G-type motors and has in addition the possibility to receive weather sensors and control appliance and dimmer modules, Somfy and much more.